A clever option to print a foldable booklet that won’t cost you anything. The ideal is to start from a standard Word document (Letter, Legal or A4 pages) with page numbers in regular order. Take those pages, shrink to half size and rotated 90°. re-order them (for example the first and last pages on a single side) then print. A big job especially when the formatting in the original document is complex. It’s never been easy, long time Word users will remember spending frustrating hours trying to make it happen. Tools like WOPR could do the job but suffered from the limitations in Word itself. A better solution is to intercept the printed output from a program and tinker with it. This retains the original formatting more easily. Clickbook has been around for a long time and does a great job at turning a document in all manner of printed documents. Not just booklets but also brochures, tri-folds, brochures etc. Clickbook works with any Windows program. However we’ve found a clever option to print a booklet that won’t cost you anything. Adobe Acrobat’s free viewer has a Booklet printing mode in versions 8 and the current v 9. So all you have to do is make a regular PDF file then use the PDF viewer to shrink, twist and re-order the pages into booklet form. Firstly make your PDF file. Office 2007 users can do that with the free Save As PDF add-in. Office 2003 and before have plenty of PDF saving options that Office Watch has mentioned in the past. There’s no need to change your original document – at least not at first. After you’ve seen the booklet output you might decide to tinker with the source file just to clear up any anomalies. Since you want to print the final product, choose a higher quality option. In Office 2007 that means ‘Standard’ not ‘Minimum Size’. Open the PDF file with Acrobat viewer v8 or v9, the program that made the PDF might do that automatically. 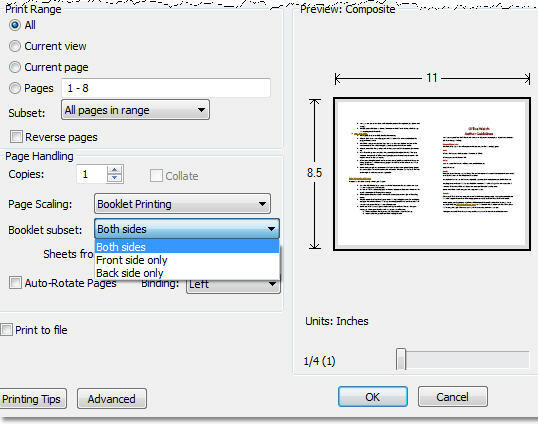 Choose File | Print then from Page Scaling select Booklet Printing. Booklet Subset lets you print all sheets at once, however you need a printer with automatic duplex/double-sided to make that work. More likely you’ll choose ‘Front side only’ and print them out then turn the sheets over and put them back in the paper tray. Choose ‘Back side only’ to print the reverse side of the sheets. You’ll probably want to test the paper turning carefully to see which way works correctly. A useful option is ‘Sheets from’. Note this talks about Sheets not pages (the pages to print is at the top of the dialog). ‘Sheets from’ lets you print specific sheets from a booklet set. A common use is ‘from 1 to 1’ for printing the first sheet only, this lets you print a cover page on different paper than the inside booklet pages. ‘Sheets from’ also lets you re-print a particular sheet in case of spoilage. Auto-rotate allows the software choose the best orientation for each page. This is handy if you have a mix of portrait and landscape pages (eg a wide table in the middle of a document). Binding Left binding is the usual choice for left-to-right languages. Right binding for right-to-lefties and vertical reading languages like Japanese. The ‘tall’ options print on portrait oriented pages with white space above and below. The preview pane is very good and changes according to your choices – use the slider to preview the pages and see roughly how the booklet will look. Use the preview to see Auto-rotate and Binding in action. If you have a PDF ‘printer’ installed (like PDFfactory or many others) you can ‘print’ your PDF booklet to another PDF file. Choose the PDF software from the printer selection at the top of the Print dialog. Open the new PDF to see clearly how the booklet will be formatted. You can also make the booklet ready PDF then send it to someone else (eg a print shop) for printing. Our PDF tip is independant of printer capabilities. Word can go part way to making a booklet. There is a ‘2 pages to a sheet’ option and book fold margin choices. But that doesn’t help with the page ordering necessary for a booklet. The first and last pages are on the first sheet plus pages 2 and second last on the reverse side. There is a ‘book fold’ option in Word 2003 and Word 2007 however it doesn’t create a booklet in the way that we and other readers expect. We’ll investigate some more for a future Office Watch article. There are many cases where the booklet isn’t the only or final printed version – ideally you have a single document that you can print in various forms without changing the source file – booklet, full pages etc. This is where a print driver or PDF option comes into its own.